Oncology - forum with Physicians ! Not to be confused with ontology, ontogeny, or odontology. See cancer for the biology of the disease, as well as a list of malignant diseases. 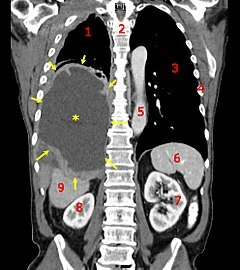 A coronal CT scan showing a malignantmesothelioma, indicated by the asterisk and the arrows. Oncology is a branch of medicine that deals with tumors. A medical professional who practices oncology is an oncologist. The name's etymological origin is the greek word onkos (όγκος), meaning "tumor", "volume" or "mass".